Effusion in a joint with the presence of blood is a Hemarthrosis. NSAIDs or Non-Steroidal Anti-Inflammatory Drugs can help to reduce swelling. Swelling is often the “root” cause of the pain of an injury. There are proteins that are part of the excess fluid of edema or effusion that can be re-used by the body. Seek advice and treatment from a Physical Therapist if you have a swollen body part. Simply put, swelling refers to an enlarged body part. Injuries often result in pain and swelling. 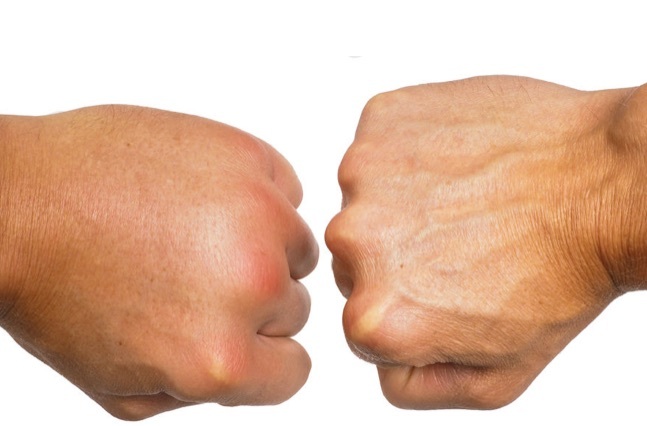 At the same time, swelling can actually cause other injuries. Proper care after an injury can help reduce swelling and prevent further injuries. Physical Therapist can offer specific guidance for treating your injury and swelling. The body part swells due to a chemical reaction within the body. When an injury occurs, there is a release of chemical agents that produce a response within the cells, making the cell wall more permeable. When the cell wall becomes more permeable and the pressure within the cell is greater than the pressure in the space between the cells (the interstitial space), the flow of fluid is along the gradient of higher to lower pressure. Therefore, the volume of fluid in the interstitial space increases along with the pressure. Eventually, the pressure in the interstitial space exceeds the pressure in the cells and the flow of fluid out of the cell is stopped. There are two types of swelling: edema – swelling that occurs primarily in the soft tissues of the body and effusion – swelling or fluid in the joint space. Edema and effusion are a result of the change in the fluid levels in and out of the cells. Both edema and effusion compromise the body part, causing pain while reducing motion and strength. The first line of treatment for such conditions is the RICE principles of acute injury care. The first response to an injury and swelling should be rest. This removes strain off of affected area and prevents further injury. In some instances like a fracture, the involved area must be immobilized or significantly restricted with the use of splints, casts and braces. By cooling the injured area, you can reduce the inflammatory response and pain. One by-product of the chemical reaction of inflammation is heat. Ice on the injury site extracts the fuel of heat and halt the inflammation. The use of an ace-bandage to wrap the injury site and increase the pressure “outside” the cell helps to artificially increase the pressure within the interstitial space and help it surpass the pressure within the cell. Once the pressure is greater in the interstitial space, the fluid will stop moving across the high to low gradient from the cell to the space. If a body part accumulates an excess in fluid, gravity can force it to flow to an unrelated area of the body (i.e. the ankle when the knee is injured). If the injury site is elevated the excess in fluid will tend to “flow” towards the internal organs that are responsible for cleansing the blood and re-using anything that is re-usable and excreting the waste. The fluid returns to these organs via the lymphatic system. Physical Therapy can also play a key role in treating edema and effusion. First, the Physical Therapist seeks to uncover the root cause of the edema or effusion. This diagnosis helps the therapist focus the exercise routine in a way that will help decrease the excess fluid in the area. Two great ways to reduce excess fluid in a body part is via muscle contraction and movement. Unless the diagnosis requires immobility, controlled motion can “force” or “pump” the fluid out of the injured area. The muscles in the injured area contract to move the joints and the fluid is moved towards the internal organs. The vessels have “one way” valves that open towards the organs and the muscle contraction “pumps” the fluid in that direction. Seeking treatment from a Physical Therapist is easy and does not require the patient to see their doctor first. The Physical Therapist is a licensed professional who can evaluate and treat a patient without a doctor’s prescription. Effusion and Edema are similar in many ways and are usually “lumped” together in layman’s terms as swelling. Regardless of the term used to describe the swelling the excess fluid that occurs needs to be addressed to restore normal function of the involved area.